A recent LTE from Putney resident Elan Moses contained too much misinformation to be useful (Governor’s misguided views on gun control). While his point that Vermont’s lack of gun legislation opens the door to many abuses, his suggestions for curing this were naïve and disingenuous. overwhelming majority of hunting rifles used in the USA today are semi-automatic). From Wikipedia: A semi-automatic, or self-loading, firearm is a weapon that performs all steps necessary to prepare the weapon to fire again after firing—assuming cartridges remain in the weapon’s feed device or magazine. Typically, this includes extracting and ejecting the spent cartridge case from the weapon’s firing chamber, re-cocking the firing mechanism, and loading a new cartridge into the firing chamber. Although automatic weapons and selective fire firearms do the same tasks, semi-automatic firearms do not automatically fire an additional round until the trigger is released and re-pressed by the person firing the weapon. A double-action revolver also requires only a trigger pull for each round that is fired but is not considered semi-automatic since the manual action of pulling the trigger is what advances the cylinder, not the energy of the preceding shot. All basic firearm actions require the action to be cycled manually before the first shot. To fire ten rounds from a semi-automatic firearm the trigger would need to be pulled ten times (once for each round fired). For other forms, the weapon’s mechanism would require cycling manually prior to firing the next round. An automatic or a selective fire weapon set to fire automatically would be able to fire continuously as long as the trigger is held until the magazine or feed device runs out of ammunition. The first successful design for a semi-automatic rifle was the German Mannlicher in 1885. In 1903 Winchester introduced the first semi-automatic rifles designed especially for the civilian market. By the early 20th century, several manufacturers had introduced semi-automatic .22 sporting rifles, including Winchester, Remington, and Savage Arms. In 1906, Remington Arms introduced the “Remington Auto-loading Repeating Rifle”. Remington advertised this rifle, renamed the “Model 8” in 1911, as a sporting rifle.. The rifle was offered in .25, .30, .32, and .35 caliber models, and gained popularity among civilians as a hunting rifle. refers to the loading mechanism, not the firing capability. He goes on to say: “I am sure you know that the truth is these are not hunting rifles we are talking about”. As I stated above, the overwhelming majority of hunting rifles used in the USA today are semi-automatic. That’s not the problem. “I hope you would agree in principle that there are certain weapons that should not be readily available, or should any citizen be able to purchase a surface to air missile launcher such as are used in many guerrilla armies?” I don’t think many people would disagree with that. Fortunately, there are Federal laws on the books dealing fully with these issues. And the penalties are severe. A musket is a muzzle-loaded, smoothbore firearm, fired from the shoulder, introduced by the French in the 16th century: the predecessor of the modern rifle. (Cf: Musketeer).They are still used for hunting in the US by “black powder” aficionados. They are not very accurate, nor are they efficient for hunting. Shoot at a deer and miss, and ask the deer to wait around for you to get out your powder horn and tamping rod! This inconvenience is offset in many states by offering special black powder seasons, affording the hunter the opportunity to bag an additional deer. “why you think it should continue to be legal to purchase a machine gun in Vermont”. Technically, this may be true, but Federal law males this nearly impossible. The lawful transfer of a machine gun generally requires (1) filing a transfer application with ATF, (2) paying a transfer tax, (3) getting ATF approval, and (4) registering the firearm in the transferee’s name. Transferees must pass an extensive criminal background investigation and meet the criteria for possessing firearms under state and federal law. Now, let’s get to the nitty-gritty. The problem is not hunting rifles and semi-automatic weapons, it is weapons having significantly enhanced capabilities that make it easy to kill large numbers. 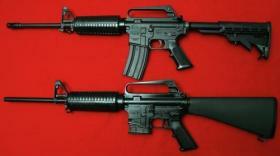 These are commonly referred to as “Assault Rifles”, but that is a misnomer. full-automatic fire options (selective fire), often with two or more of these available on the rifle at once. But there are “imitation” assault weapons that look like, feel like, smell like and even taste like, but don’t function like the real thing. These are glorified “toys” designed for selling, not using. They are not well suited for hunting or target practice, but can be extremely dangerous. In certain states, like California, weapons that “cosmetically” resemble true assault rifles, but are only semi-automatic (autoloading), are categorized as “assault weapons” and possession by civilians is generally illegal. Supporters of gun rights generally consider this application of the phrase “assault weapon” to be a misnomer. What makes many of these weapons extremely dangerous is their capability of accepting large capacity magazines. You don’t need a hundred round magazine for self-defense or to bag a deer. Most other states have similar regulations (In New York, the number in the magazine is 5). So, the task is to craft legislation that permits hunting weapons without banning most guns simply because they’re semi-automatic, or because they look like real assault weapons, and at the same time limit magazines to a sensible number of cartridges. This shouldn’t be hard to do. wants to take your guns away, they will!